DESOTO—Every generation in America has their own memories of bloody mass shootings. In 1921, as many as 300 people were killed during a Memorial Day Riot in Tulsa, Oklahoma. In 1966, Charles Whitman sought notoriety as he killed 16 and wounded 31 atop the University of Texas at Austin clock tower. Most recently a church shooting in Sutherland Springs, Texas, left 30 dead in its wake. It continues to make headlines and has sparked a national discussion on what to do during an active shooter event. 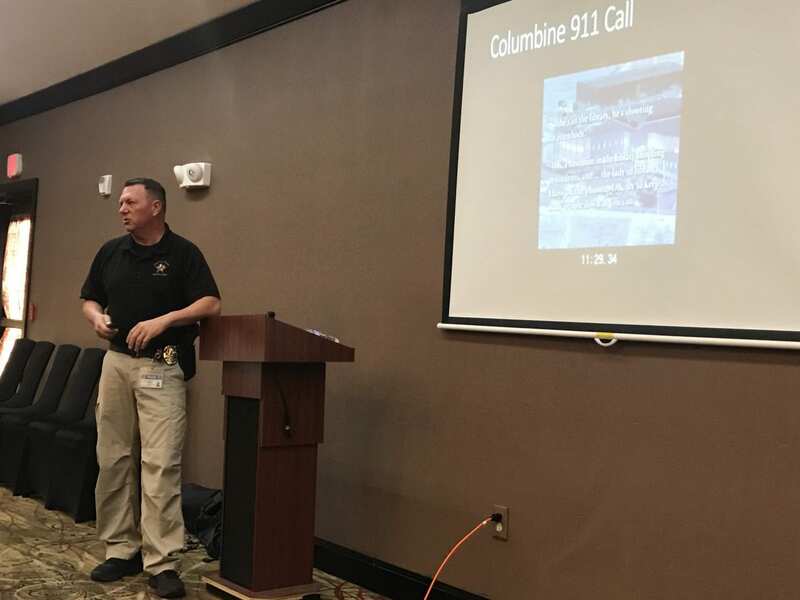 This week the DeSoto Chamber of Commerce hosted a seminar on Active Shooter Response, led by Sergeant R. Heath Penwarden. The seminar was a part of the Chamber’s “Lunch and Learn” Series held at the Town Suites Marriott. During the afternoon session Penwarden gave an emotional and thought provoking clinic on how victims of a mass shooting event can increase their probability of survival during the police response time. The period of minutes between the beginning of an shooting incident and the time police reach the scene are critical, says Penwarden. While the acts brave individuals who charge terrorists on planes or those who chase down mass shooters can be inspiring. Penwarden says that they are also dangerous. Your chief job in these dire situations is to stay alive. During an active shooter incident the normal response time nationwide is 3 minutes. In that amount of time a lot can happen. Attendees of Tuesday’s class learned the A.D.D. method. AVOID. DENY and DEFEND. Avoid: Beaware of situations and surroundings at all times. Know your exits and act fast. Now isn’t the time to capture video or live update to social media sites. Leave the premises if possible. Deny: Lock doors. Turn off lights. Stay out of sight of the shooter. Sergeant R. Heath Penwarden has been an Officer with the DeSoto Police Department since 1996. The Austin native graduated James Bowie High School, attended Texas State University and currently holds a Master Peace officer Licence with TCOLE. Sgt. Penwarden has held numerous positions within the Police Department from Detective, School Resource Officer, Patrol Sergeant and Bike Officer. Currently Sgt. Penwarden is assigned to Internal Affairs and Training. He is also the Team Commander for the Southern Regional Response Group- Special Response Team (SRRG-SRT), which is a multi-agency SWAT team. Sgt. Penwarden is an instructor for Firearms (rifle, pistol, precision rifle), Shoot house, Police Mountain Bike, Active Shooter response, Low Light tactics, Civilian Response to Active Shooter, and Self-aid Buddy-aid. Sgt. Penwarden holds several memberships; National Tactical Officer Association, Texas Tactical Officer Association, American Sniper Association, International Police Mountain Bike Association, National Rifle Association and the Texas Association of Hostage Negotiators. Sgt. Penwarden has received Officer of the year in 2003 and the Doris Black Award 2002. Lunch & Learns take place monthly and dates are subject to change. Sponsors present on an array of topics that can pertain to Social Media, Financial Wellness, Active Shooter Response, etc. Sponsors sometimes bring in lunch, however you can bring your own lunch. Locals, members, and other business owners, etc. are invited to attend. There is a non-member fee of $7 per person to attend. For more information about the next Active Shooter Clinic contact the DeSoto Chamber of Commerce at 972.224.3565 or desotochamber.org.